Its been a while since I posted on my blog but I’m sure everyone can appreciate how hectic it has all been, but I am giving my scouts honours word that I will be posting a new tutorial more regularly. Firstly, and most importantly, I will like to say a huge thank you to all of you who have supported my sewing bee journey, I am so grateful for all the kind messages that have kept me very busy responding. to all the new followers, welcome to my blog and I hope it will be a useful resource for you. I really felt the support of the British public and am so pleased with how my approach to sewing has been received. Doing sewing bee is an experience I will never forget and I am so thankful to have been short-listed for the programme. I know the application for next years series has closed but I will strongly recommend anyone considering taking part in the one after to go for it. Being in a room full of people who shared my passion for sewing was amazing and something I had never experienced before. All the contestants were fantastic; a really good bunch and I loved every minute of it. When it came down to the final and it was just Heather, Tamara and myself, I must admit that it induced some bitter-sweet feelings; I was proud to be competing with such experienced sewists in the finals but was also afraid of that same fact. I have to say that losing the crown to Heather, was not a loss at all, technically, Heather is a fantastic sewist and she is highly skilled, she deserved her win! I’m sure everyone remembers my tie melt down. Gosh that was a very wordy pattern and not being a pattern girl it completely threw me. Prior to the sewing bee I had never used a pattern, but when I was confronted with my first pattern for the show, I relied heavily on the pictures for direction. So sorry to all those who were disappointed with the melt down, but hey, I never have to make a tie EVER again (I say that now but something inside me tells me I will soon post up a tutorial on making a tie freehand). 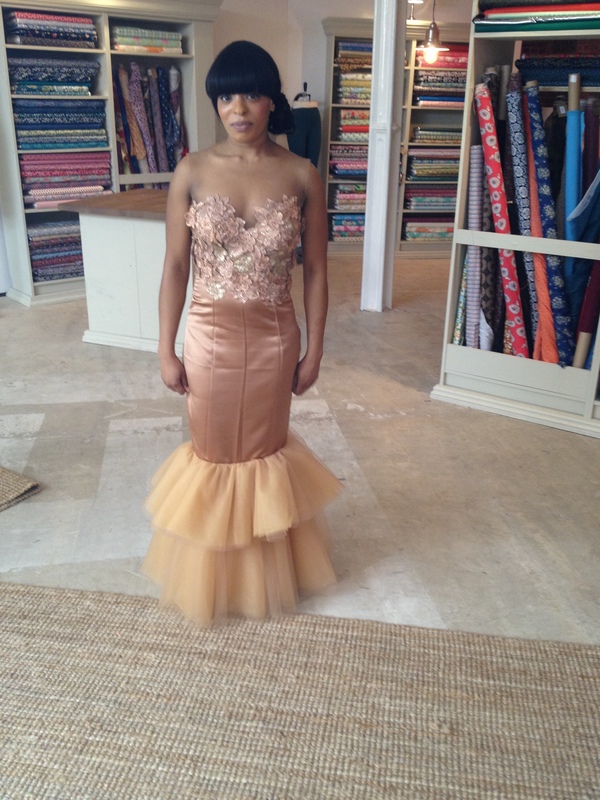 I love making glamorous gowns so designing my finale dress was O so joyous to say the least. I have to say a massive thank you to my bestie Rose for being my model, I still cant believe it, she doesn’t even do phone cameras so imagine my utter shock when she walked in to a room full of broadcasting cameras for a BBC programme, talk about conquering your fears!! Extreme! The dress looked amazing on Rose and I was very happy with it. Wish I had some more time to press out all those creases though. Chinelo, I was so disappointed that you didn’t win the sewing bee. Heather was good and pulled out a fantastic final garment, but she played it safe all the way through. Overall I thought you deserved it because of your natural flair. I would love to attend one of your workshops, but would find it difficult to get to London. However, I wish you well and I’m sure they will be very successful. I look forward to receiving any tips etc., by email. Good luck and well done on your success in the show. You have lots of fans in the north of England. Chinello I was sory you did notwin sadly yoour tie let you down. You were amazing on Sewing Bee and have lots of fans in the US – we loved watching you create garments and looking forward to learning more from you! Thank you! You were so fantastic on the Sewing Bee. Your styles and techniques were fabulous and aspirational. I was rooting for you the whole time and was gutted when you didn’t win. Nevertheless, youwere awesome and even with the tie melt down you did great! To me it showed how much it mattered to you to do well and you still pulled through. Well done! I would love to come to your workshops, but unfortunately Am unable to. Would love to know of any futur upcoming workshops or any other events in the future. Do you do custom-made work? I would love to have the opportunity to speak to you about that if possible. You did fabulous on the sewing bee! I think you’ve inspired more sewists to think beyond the commercial patterns and do more draping and freehand…that’s a great accomplishment! I think you have a real talent for creating beautiful garments, your natural flair is brilliant and I would have liked you t.o win the sewing bee, but you did extremely well. you will go far. Chinelo, I loved watching the way you work when freehanding clothes. Your evening dress was an absolute stunner! I would have liked to see both you and Heather win – it was neck and neck. I know you will go on to greater things. Hmm, wonder if they’ll do the Great Australian Sewing Bee? Yay Team Chinelo!! I was routing for you for the whole series – your posh gowns are amazing, and all freehand – your skills astonished me every week. I wish you’d won but I understood why the judges picked Heather – she definitely has the technical skills. Can’t wait to see more of your freehand tutorials! You have every reason in the world to be proud of what you’ve done — and what an example you’ve set for folks who are afraid to do something. You did incredible work and have a lot of creating yet to come! I really enjoyed watching you work. Best Wishes! Brilliant work on the sewing bee. Prompted me to get sewing again. I sincerely wish you all the best for the future. Looking forward to your overseas project. Congratulations on your accomplishments on the Sewing Bee. You were great all thru the competition. It’s amazing how beautiful your work is. I watched on You tube since I’m from Puerto Rico (US territory). I’m so glad someone put it there so the whole world of sewing fans could watch. I will be checking your blog to learn more about you and your work. Hi Chinelo, I love love watching sawing bee I have watched it like 20 times now on iPlayer. I feel so proud to be a Nigerian and you’ve reignited my love for sawing. So disappointed that you didn’t win but hey you’re a winner to me always, thanks for the measurement video on YouTube looking forward to more of your tutorials.